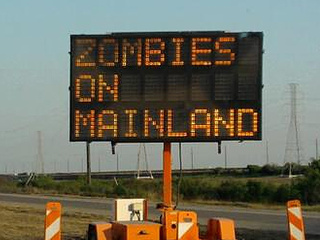 While leaving the Island this morning we were warned of zombies. The sign was apparently hacked. I was appreciative of the warning. According to the Houston Chronicle , The Texas Department of Transportation takes these types of pranks seriously. Usually a lock is broken on the sign to make changes to it. If the pranksters are caught, the state says they can be fined up to $500. Michael Smith of the Galveston Daily News informs us that while this may all be a hoax we should remember some pointers just in case. Then again, these reports could all be the product of a duped media dimwittedly buying the great zombie cover-up, in which case you’ll want to visit this site. And remember: Your best shot is a headshot. Previous PostLifestyles of the Rich and FamousNext PostA Grass Roots Campaign.